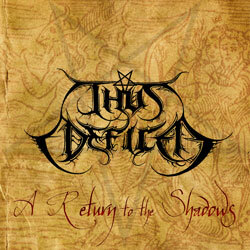 Thus Defiled are a band from t he United Kingdom that has been featured before in this zine and plays a very raw and melodic form of satanic black metal and this a review of their self released 2017 ep "A Return TO The Shadows" which will be released in June and consists of covers from Death, Metallica, W.A.S.P and Morbid along with one original and unreleased track. Atmospheric soundscapes start off the ep along with some demonic voices a few seconds later which also leads up to a more heavier and melodic direction which also uses a great amount of black metal screams and death metal elements and when t he music speeds up a decent amount of blast beats can be heard. All of t he musical instruments on the recording have a very powerful sound to them while the solos and leads have a vintage black/death metal style to them along with a few growls and the songs also bring in a great mixture of slow, mid paced and fast parts and spoken word parts are also used briefly and on the cover songs they retain the feeling and atmosphere of the originals while also mixing in their own style. With this ep Thus Defiled bring in one original track that is in the direction of their albums while adding a black/death metal touch to t he cover versions, the production sounds very powerful for being a self released recording while the lyrics cover Occultism, Demonology and Horror themes. In my opinion this is another great sounding recording from Thus Defiled and if you are a fan of black and death metal, you should check out this ep. RECOMMENDED TRACKS INCLUDE "Armagedda In Rupture" and "Hellion". 8 out of 10.